Ireland's Slomatics have been around since 2004 and in that time they have put out numerous releases and have appeared on splits with the likes of Conan. Their fourth full length LP "Estron" shows that Belfast born Slomatics are easily as heavy as any of the heaviest bands you are ever likely to hear. Slomatics are bone breakingly low-end and have mastered the art of boiling their riffs down into simple yet extremely heavy weight drones that give a few nods to Torche/Floor in a rumbling earthquake of bomb strings. The 7 tracks that make up "Estron" give you little time to catch your breath from the chest crushing freqs that are delivered in punishing waves of massive and explosive doom riffs, except that is for the 6th track "Red Dawn" which serves as a kind of retreat from the storm of pulverizing heaviness. That is not to say that every track on "Estron" is a relentless barrage of lowness as there are captivating moments of psychedelic droning atmospheres and experimental use of effects and synthesizers that show Slowmatics are about far more than just playing the biggest and heaviest riffs that 3 humans can possibly produce together without causing serious injury to themselves and anyone who is listening. 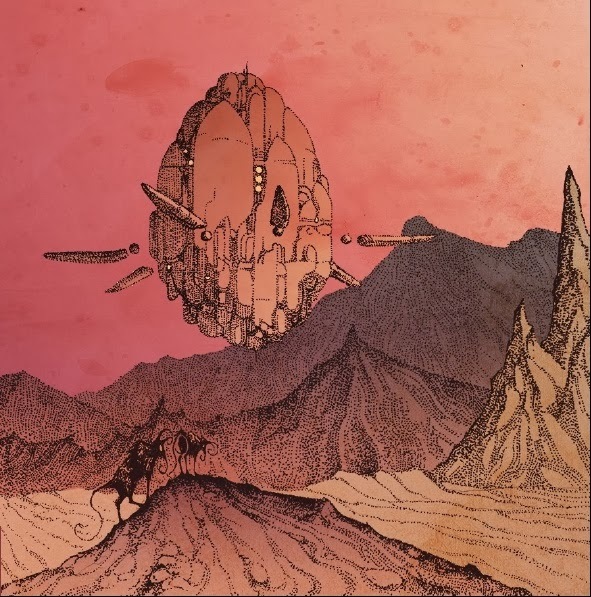 "Estron" is very close to being dangerously heavy and this is at the core of Slomatics' sound but the futuristic psychedelic sound-scapes produced by these 3 Irishmen make this album one of the most enjoyable listening experiences so far this year.